When she walked away you started furiously Googling, “social media influencer programs” and that’s how you found this post. Not to worry, we’ll get through this together! Below I’ve listed a few of the main types of influencer programs you can run, including tips to help choose which one’s right for you. Two notes before you dive in. Their area of expertise. What’s their domain? Is it a vertical you care about? Their audience. Are followers engaged? Are they targets of yours as well? Their community size. Assuming the influencer is an expert in your domain, and their audience is wildly engaged with their content, then the last factor is size. There’s no hard and fast rule here, rather a sliding scale based on the first two factors. 2.) Any good influencer program must be supported by clear and conspicuous disclosures. What does that mean? You, as the brand, bear the burden of ensuring that your influencers clearly disclose to their readers/fans/followers that they’re being compensated. Compensation includes everything from free or discounted product, sponsored travel, etc. Purposely trying to hide this form of advertising from consumers is unethical, and in the US, it’s illegal. Disclosures can be as simple as a footnote, a hashtag (#sponsored) or be copy in the body of their post. It just needs to be obvious. Because, ethics! The gist: You give celebrities or influencers in your community free or discounted product in exchange for their posts reviewing your product on social. These reviews can appear on dedicated reviews websites, in communities, and on personal profiles or blogs. Typically you don’t pay an additional fee for these reviews, however some major reviewers may charge. The benefit: Customers trust user reviews, even more than company descriptions, and rely on them for making purchase decisions. By building up a library of reviews, you help validate and shape perceptions for your product. The gist: You give free product to influencers in your community. They post about using it on their personal profiles. You can also give them free product to give away to their followers. There’s often a fee associated with these types of endorsements. Influencers can be people with big followings, like celebrities, or people with very engaged followers, or super active users in target communities. The benefit: When customers see someone they admire using a specific product, it piques their interest. If someone they trust or look up to uses a product, it means it’s probably something they should try too. If they’re giving away product, you’re helping raise awareness with a ready-made target group. Who it’s for: This is really an effective lever for most brands. My caution would be to use the paid version of this tactic sparingly, and instead try to surface the community members who would be excited to endorse you for free or just in exchange for free product. Example: I hate to use the Kardashians, but gird your loins, because I’m going to. Here, Khloe, Kylie, and Kourtney show off some waist trainers. If you were an impressionable person, looking for a quick fix, and not aware of the dangers of waist-training, you might think, “Oh wow! I love those girls, I wanna be like those girls. I’m gonna buy one of those trainers!” (Note: the K’s didn’t indicate that the post was sponsored…but I bet you they got those trainers for free…thus, a stickler like me thinks they should say something about their affiliation). The gist: You have a network of influencers that you send content to — be it product news, company updates, sales or specials — and those influencers pick and choose what they want to reshare with their own followers. 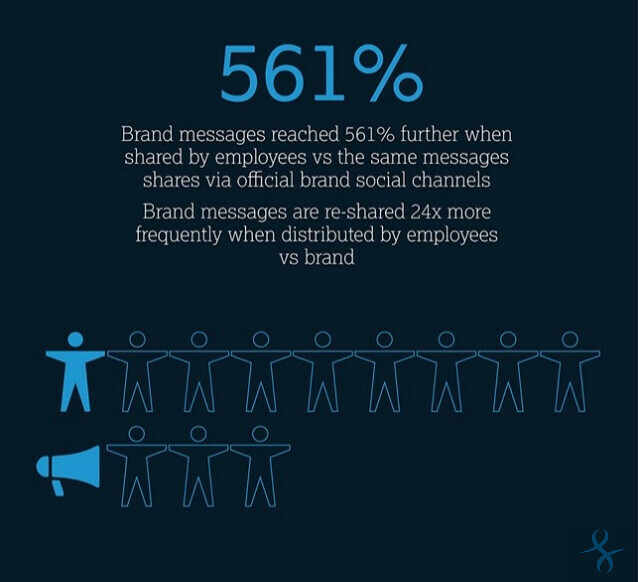 What’s interesting, is a lot of brands are beginning to run these types of programs with their own employees too, turning staff into influencers. It’s kind of like deputizing brand advocates as media in their own right. You pre-brief them in the way you’d brief editors. You can gamify their participation with leaderboards, make them feel a part of a private club through intimate meetups and even jerseys. The benefit: Sure, you can promote your own news from your brand handles, and your brand loyalists will gladly read and engage. But, to reach a broader audience, it’s helpful to have influencers share your news too. In a way, it’s like an endorsement, albeit passive. And, trust is much higher for a third party than the brand itself. For employee advocates, it’s a great way to help them feel like a more integral part of your company and like they’re impacting the brand in a way beyond their day-to-day jobs. Besides, who’s a better brand influencer than the people who create the brand?